What do your Rituals say about your Company Culture? Rituals are experiential reminders of what is most valued and are a vital component to creating a cohesive company culture. 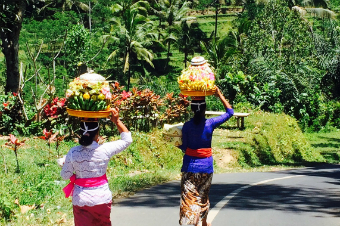 As I biked with my husband through a village in northern Bali with verdant rice paddies as the backdrop, we saw several women walking one after another on the road toward the temple. They were wearing brightly colored sarongs with yellow sashes and their necks were erect as they carried several offerings on their heads. Our guide explained that they were preparing for a special ceremony at the village temple. He also told us that every day the Balinese make offerings within their homes and temples. The offering is a carefully folded leaf containing a bit of rice and pink, yellow and orange flowers arranged just so. The ritual is not long, it is the intention of holding the energy of the blessing and connecting to the source that is important. We witnessed this rite at our hotels, the restaurants where we had meals, the store and the spas we visited. Religions are well known for having a variety of rituals whether it is to commemorate significant occasions or monthly, weekly or daily practices that serve to unite their community and fortify core beliefs. Smart companies understand the power and purpose of rituals. They serve to provide a shared identity, foster social bonds, pass on history, reinforce what matters and explain the why behind “this is how we do things around here.” When a collection of people (which is really what a company is) has a shared experience as such, this is an effective way to build a cohesive culture. Culture has been shown to be a company’s competitive asset because it can serve as a talent magnet and cannot be replicated whereas capabilities and products can. Below are examples of company rituals that continually emphasize their purpose and a specific value. Mindfulness: A digital meditation company has daily “take tens” for people to collectively meditate for 10 minutes (voluntary). Success: Every Monday a bank has a 10-minute call (which is recorded) to update the whole company of the successes from the previous week. Fun: A hula hoop company takes daily “hoop breaks”. Innovation: An emerging technology company holds monthly half-day Hackathons involving all team members in order to solve an internal or customer challenge. When a new team member joins your company, this is a precious opportunity for them to experience your values in action. Below are some rituals or practices that my clients have implemented consistently. A service company has each new team member take a pledge to uphold the company values. A glass factory in Mexico invites the team member’s family on his first day, including them on the tour and lunch. A research company places flowers or balloons on each new team member’s desk on their first day. Company rituals are an indispensable way to build a cohesive, effective culture which has been linked to organizational performance. [i] By carefully crafting them, you have an opportunity to bring team members together in ways that will solidify collective commitment. Brainstorm what shared experiences you can habitually create to foster a collective identity and emphasize what is most valued in your company. When new people join the company, what consistent practices might you implement? Is it a checklist or an experience? When people are promoted, do you have a ritual? If it is an announcement by email, how might you turn it into an experience? What about when people leave? Especially consider when it is an involuntary exit. How does their experience encompass your values? How can you best include remote team members? When crafting rituals and habitual practices, keep this utmost in your mind, because this is often an oversight which imparts that remote workers are not as important. If you have a minute, please let me know some of your favorite company rituals. [i] Research by Kotter and Heskett, in their book Corporate Culture and Performance (2008), demonstrates that an effective culture can account for up to half of the difference in performance between organizations in the same business. Money Magazine, by studying the best-performing stocks between 1972 and 2002 (e.g., Southwest Airlines, Walmart, and Comcast), also concluded that culture drove financial performance and found that these companies outperformed their competition by an average of 23% annual return. http://pinwheelperformance.com/wp-content/uploads/2015/11/Ritual-3402.jpg 226 340 pinwheel http://pinwheelperformance.com/wp-content/uploads/2014/09/Pinwheel_Logo_Package-04-300x138.jpg pinwheel2015-11-10 14:40:252016-04-09 14:17:28What do your Rituals say about your Company Culture?